Summary: Requests for qualifications are being solicited from contractors and specialty subcontractors for renovations to the Show Me Center, an arena on the campus of Southeast Missouri State University in Cape Girardeau, Missouri. Convergence Design is leading the design of the renovation. Show Me Center director Wil Gorman stands inside the Cape Girardeau venue earlier this year while discussing some of the renovation possibilities. Although renovations to the Show Me Center aren't scheduled to start until summer, steps are being taken to make sure things go smoothly. Written qualifications for general and subcontractors are due to the Facilities Management Department at Southeast Missouri State University on Nov. 14. The improvements have been discussed since earlier this year. In June, the university's board of regents approved moving forward with the project. The total cost is estimated at $8.7 million. The first phase is due to start in May. Kathy Mangels, vice president for finance and administration, said that means the university needed to start advertising and awarding contracts well in advance. The first phase includes replacing the center's telescopic seats, which can be pushed in and out, replacing the lights and sound system, installing a new video scoreboard and replacing the roof. The second phase, slated to take place in summer 2016, will include making updates to the rigging grid, meeting rooms and looking at the parking areas. Thousands of people have attended events at the 27-year-old Show Me Center over the years, ranging from Southeast commencement to concerts and sporting events. It's also used for a wide range of community events and camps. Mangels has said work would take place during those summers because that's when the Show Me Center arena and building are used least. "This is a very tight schedule when you look at the multiuse of that building," Mangels said. "The schedule really can't slip in terms of construction, so we want to award a contract so they can be ordering the seats, the scoreboard -- all of those things that have a long lead time. As soon as commencement is over and we get through the spring semester, we want that contractor to be ready to move in [and] have all of their materials ready to go because they will have to be done in August before the school year starts." Parking lot repairs also are included in phase II, but Mangels said the university wants to get construction done first "so that we're not tearing up what we've just installed." 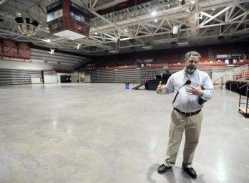 Departments that planned events at the Show Me Center during the summer were asked to consider using other space, such as the recreation center or the Osage Centre, run by the city of Cape Girardeau, or other community venues, Mangels said. Organizers of other events also were given different space options. Convergence Design of Kansas City, Missouri, and a team of consultants are working on the Show Me Center project. 1 University Plaza, Cape Girardeau, Mo. * Opened in 1987, the Show Me Center is a venture of Southeast Missouri State University, the city of Cape Girardeau and the state. * It is home to Southeast*'s Division I men*'s and women*'s sports teams, it serves as a venue for everything from monster truck and car shows to big-name concerts, private events and meetings. * Because what*'s in the building is original, parts for certain items such as the seating are not available, and the scoreboard uses incandescent bulb technology, which is not energy-efficient and is outdated.